This month sees the opening of an exciting exhibition at Tate Liverpool, exploring the shift of language in an ever-changing and culturally charged society. 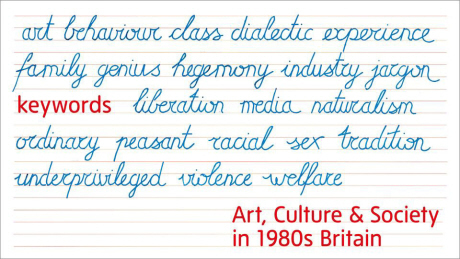 Keywords: Art, Culture and Society in 1980s Britain explores British art in the 1980s , a tumultuous period when oppositional politics were fighting for space within the social sphere. Art and culture were heavily influenced by a series of words that had evolving and loaded meanings – amongst them ‘liberation’, ‘behaviour’, ‘unconscious’ and ‘romantic’. The exhibition takes its name from the seminal 1976 book by Raymond Williams on the vocabulary of culture and society, which has recently been republished. Academic, critic and left-wing thinker Williams devised the term ‘Keywords’ for words that repeatedly appear in discussions surrounding culture and society, spanning their origins from centuries ago to their current use in society and the range of meanings attached to it. Starting in the 1950s, Williams collected a group of words including ‘media’, ‘country’ and ‘criticism’ and over time built up a series of short essays on over 130 such Keywords in a fascinating insight into a language as well as a country in flux, often thought of by many as a cultural handbook. The Keywords exhibition at Tate Liverpool takes a closer look at how language and art collided in the 1980s and beyond, using some of the book’s terms to group together almost sixty modern artworks from artists such as Rita Donagh, Peter Kennard, John Latham, Stephen McKenna and Jo Spence. A number of artworks will be uniquely re-presented in the exhibition, which considers art, culture and language in the sphere of a vastly political society with much upheaval and uncertainty. Prior to its display in Liverpool, Keywords was previously on view at Iniva (the Institute of International Visual Arts) in London and its arrival has been anticipated by a series of Keywords lectures at Tate Liverpool which began last year. Find out more about the Keywords exhibition at Tate Liverpool by visiting the Tate Liverpool website.